Imagine, you wake up in the morning, and lost the most highlighting mole on your face. Will you realized it? Just imagine. I might freak myself out. 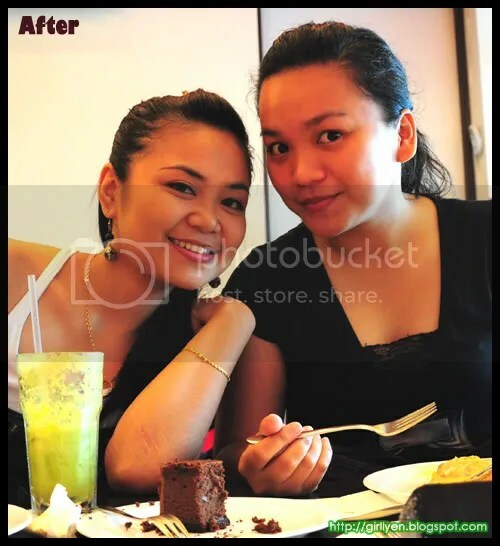 This is our picture took at Secret Recipe, Warisan Square, few months ago. Barbara and I by adik kecik. Which one is better? With or without the mole? Not much different isn’t it? But still, I look weird. pemanis muka bogia tu mole tu. whoa! you look different.ADOBE PHOTOSHOP! lol! i want you with the mole! cuter sweeter! i agree with chegu Carol..ur mole tu pemanis gia..